When Banbridge CC announced they’d be entering a young team into the international Tour Of the North few believed that they could have such an impact on the event, known for years as the Northern Ireland’s premier international Easter stage race with a rich history. Indeed, with an average age of only 20 years old and 3 members aged 18 or under the young team would be up against it with experienced international teams from Holland, France, England and Scotland – not to mention the seasoned campaigners from Ireland who are known to hold their own on home turf. The team obviously had other their own expectations for the race however, and they weren't intent in simply taking part to make up the numbers or ‘just get around’. The first stage on Saturday, a 110km road stage, could hardly have went any better – the young lads were right in the mix from the drop of the flag, scoring points in the very first King of the Hills prime and penetrating breaks, and it would only improve from there. In the final 10 miles of the stage Moneyslane man Gareth McKee put in a blistering attack that could only be followed by one of the International Dutch riders. Approaching the line he would put in another effort which would see off his breakaway companion to take the first stage win of the weekend and with it the leader’s Yellow Jersey. Mark Downey would then lead in the remainder of the main bunch to give Banbridge CC two men in the top 3 in the stage and General Classification along with both the Yellow and White Jersey for best Under 23 rider. Unfortunately Cameron McIntyre would have the misfortune to crash, snapping his bike and having to revert to the spare – but he quickly wiped himself down and got on the task at hand, determined not to be beaten on his first attempt at the international event. 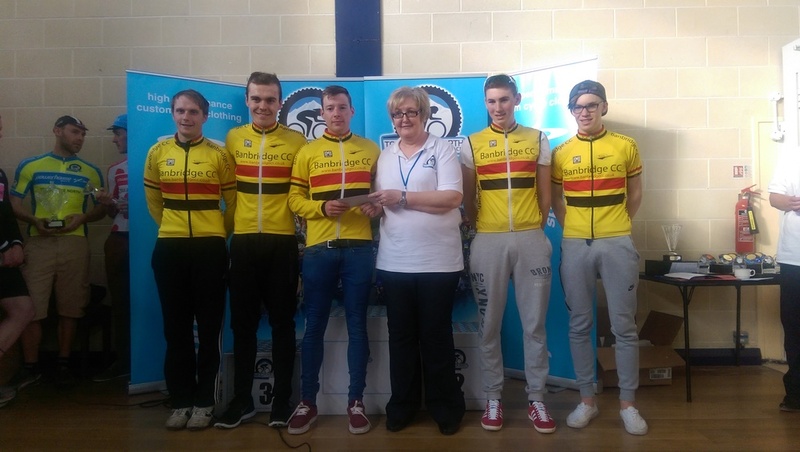 Both Lyndsey Watson and James Curry finished well up the bunch – enough to give Banbridge CC the leading team on the stage and General Classification. Easter Sunday was a double stage day. Stage 2 would see an early start for the riders with a short time trial. Obviously inspired by his yellow leader’s jersey McKee put in the best time of the team , only 12 seconds off the winning time of Chris McGlinchey of Chain Reaction Cycles. Mark Downey would also perform well with a top 15 placing leaving him still very much in the mix for White and overall GC. Stage 3 was another hard road stage, only a couple of hours following the morning’s lung busting time trial. Again the Banbridge jerseys were at the front and covering all attacks, as well as setting up some of their own. Watson, Curry & McItyre were all on team duties in support of McKee and Downey and the group worked superbly as a tight unit, catching the eye (and hurting the legs!) of several onlookers – the realisation had hit that these young Banbridge lads were not to be underestimated and were very much a considerable threat. 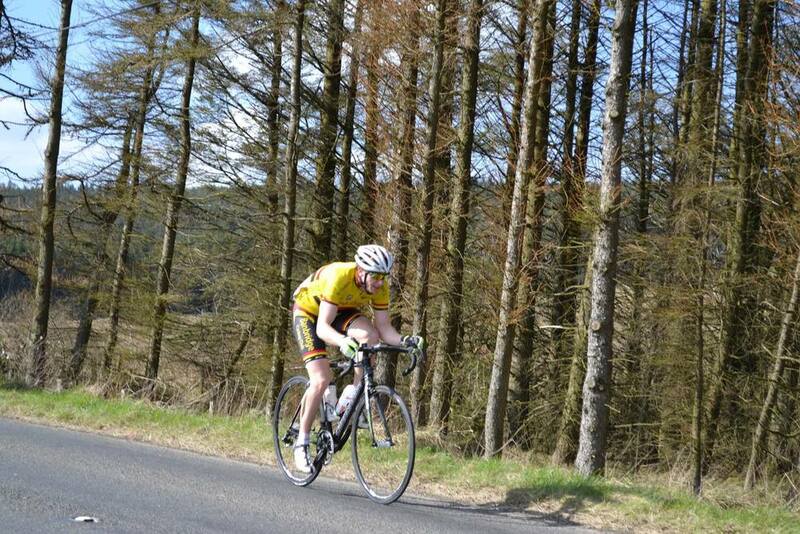 The Banbridge jersey was now one to look out for in the breaks. In the closing miles a significant group had broken free of the bunch, with Mark Downey making the cut. In the gallop for the line Downey would cross the line on the wheel of Dave Watson of North Down in 5th place, enough to see him back in the White Jersey of best Under 23 rider and only 7 seconds off the overall lead. It was Watson who had played his tactics right and would now take over the Yellow leader’s jersey. All other Banbridge riders would come home in the main bunch some 30 seconds later, however McKee was still very much within touching distance of yellow at only 15 seconds. The team would also retail 3rd place on the overall General Classification. Stage 4 would see the riders face another tough road stage on Easter Monday, with the climbs of Springwell and the Cam Forest. The start was delayed by a few hours due to a funeral on the circuit, allowing for a little extra time to recover the legs from the stress of the previous days. As riders gathered and prepared for the finale, questions would be asked of the riders plans – there would be little hesitation from the Banbridge camp, “attack, win the race!”, and while Downey was happy with his White jersey it was clear he also had his eye on the Yellow to go with it. With the racing finally under way it didn’t take long for the attacks to come, the most significant of which would reach the first main climb of the day with a minute’s advantage – McKee was there. Stringing out his 9 breakaway companions as road arose he was now the virtual leader on the road, much to the delight of the Banbridge supporters who littered the route proudly in their yellow, black and red jackets – a common sight over the weekend. On the steepest climb of the day however the break would be reeled in and the leading contenders were once again watching each other for the next move like a game of chess on two wheels. Unexpectedly it was the leader’s yellow jersey of Watson who managed to slip off the front in a group while the others watched one another to see who would take up the chase. Significantly for Downey, Watson’s group also contained Craig McAuley of Caldwell Cycles who was only 7 seconds down in the under 23 category for the White Jersey. With his hand forced the chase was on. Remarkably it was Watson who would lead out the final sprint, clinching both the stage and the overall victory. Downey would lead out a long sprint from 500 meters in the chasing group in an attempt to save his White Jersey. With the Banbridge supporters biting their nails in anticipation of the result it was revealed he had indeed done enough – with only 2 seconds to spare! The remainder of the team all rode strongly to cross the line in the same chasing group to defend their 3rd place in the team classification, a fantastic result for such a young squad which led to many congratulations from other teams and officials – not only on the result but the manner in which they rode the race from the front.